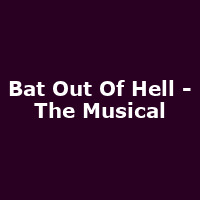 "Based on the most influential albums of Jim Steinman's storied collaborations with singer Meat Loaf, Bat Out Of Hell is a romantic adventure about rebellious youth and passionate love against the backdrop of a post-cataclysmic city. Following Strat, who has fallen in love with the daughter of the despotic Falco, this new musical is a high-octane rock'n'roll adventure that tears through over 20 of Steinman's hits, including I'd Do Anything for Love... (But I Won't Do That), You Took the Words Right Out of My Mouth (Hot Summer Night), Dead Ringer For Love, It's All Coming Back To Me Now, Two Out Of Three Ain't Bad and Bat Out Of Hell." The show won the "Best Musical" award at the 2017 London Evening Standard Awards.